Nearly all Credit Unions are moving towards Voice Over Internet Protocol (VoIP) Solutions for their phone systems. Our custom, hosted solution fully integrates with your Cloudworks virtual desktop and other key systems. Cloudworks – VoIP is our business-class Hosted PBX solution with the flexibility and scalability of Internet communications. 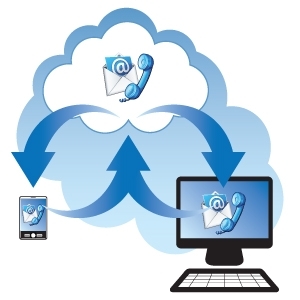 With Cloudworks – VoIP, your communication is no longer dependent on hardware or location. In addition, you get a host of communication tools you won’t find on any traditional telephone system, at any cost! It’s all part of our converged voice and data service, which consolidates your communication network, increases employee productivity, reduces your costs, and basically just makes your life a whole lot simpler. And with our enterprise-grade Quality of Service (QoS), and managed IP network services, you’re assured of the most reliable communication solution available anywhere today. Ongoing Operations VoIP is a fully managed solution that utilizes the best in physical phone hardware. Employees also gain access to their corporate phone number, voice mail, directory and other features through the online IP communicator. This allows any computer to double as a corporate phone line when connected to the internet. For clients already utilizing the Virtual Desktop, adding our custom VoIP solution is a quick and cost-effective way to transition to VoIP and boost overall efficiency. The VoIP Solution seamlessly integrates all of your messaging and eliminates the complication of owning a phone system. What can Cloudworks – VoIP do for your Credit Union? Cloudworks – VoIP eliminates the need to purchase or lease expensive PBX equipment to gain advanced calling features such as voicemail, automated attendants, extension dialing, call forwarding, call park, or call transfer. Cloudworks – VoIP also eliminates the need to obtain service from multiple carriers for local and long distance calling, PBX tie-lines, private lines, etc. The service also includes Internet access and Quality of Service (QoS) to guarantee voice quality, all on one invoice. Bottom line, Cloudworks – VoIP offers freedom from legacy equipment costs, eliminates reliance on slow-moving traditional phone companies, multiple bills, and offers flexibility to deliver customized user productivity solutions for your company.